Chinese New Year is always the most exciting time of the year. Every year on Chinese New Year eve, reunions will be held as a get together to have a meal to celebrate and usher in the New Year. This year’s Chinese New Year Eve reunion dinner was held at Grand Kingdom, the restaurant which we frequent regularly for Chinese food in KL. To kickstart the feast, we had the Fresh Salmon and Prawn “Yee Sang” or Prosperity Toss which is a Teochew style raw fish salad. 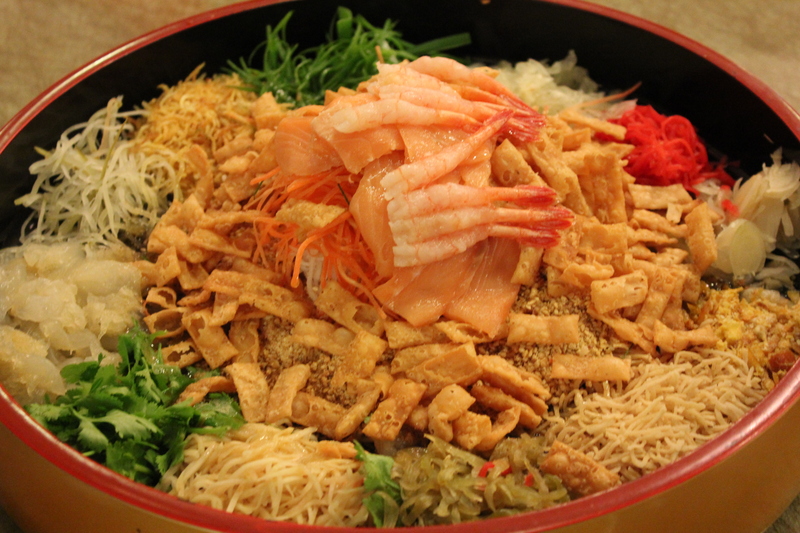 Yee Sang is traditionally eaten during Chinese New Year and is considered a symbol of abundance, prosperity and vigor. After all the ingredients were added to the Yee Sang, everyone gets up and toss the ingredients high in the air with joyful exclamations. It was a great start to the feast with fresh flavours and crisp. Following the Yee Sang we had the Roasted Whole Suckling Pig. 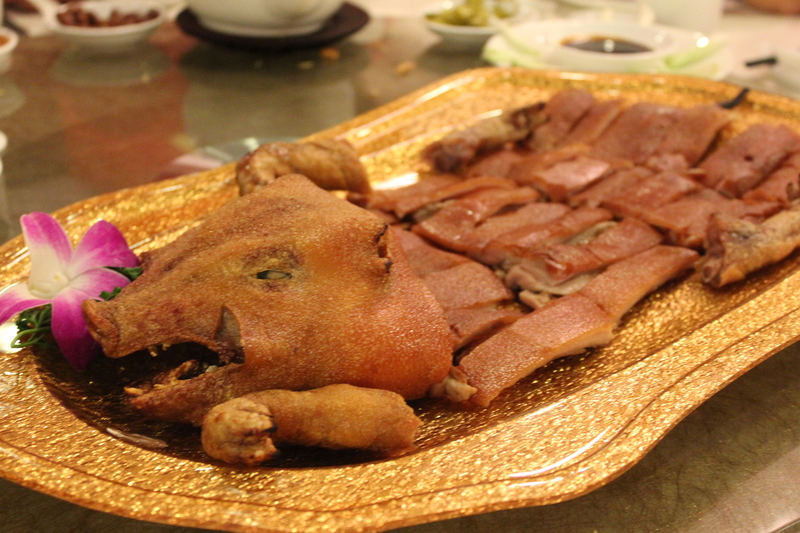 The suckling pig was cut down to thin strips with its crispy skin, a thin layer of fat and a bottom layer of pork. It was tasty. The Steamed Tiger Giant Garoupa with Soya Sauce arrived. 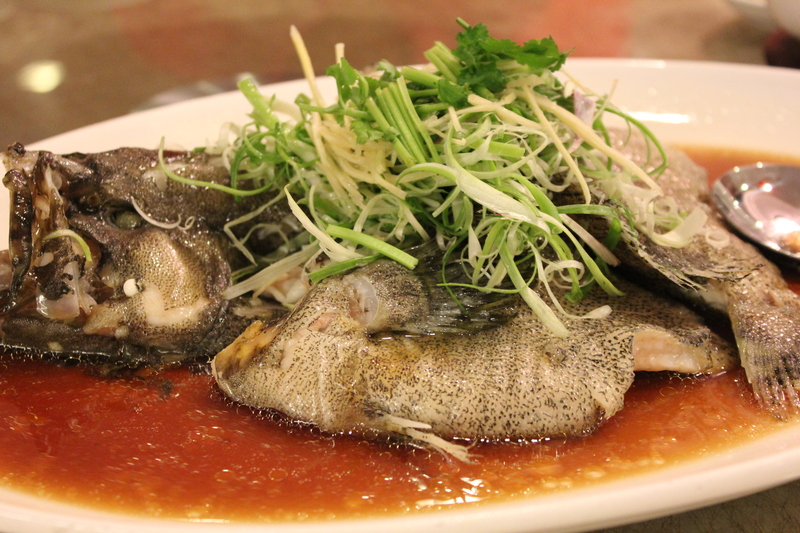 I am a big fan of steamed fish and I love love this dish! The garoupa was steamed perfectly. Soft and smooth, it was absolutely delicious with the soya sauce. 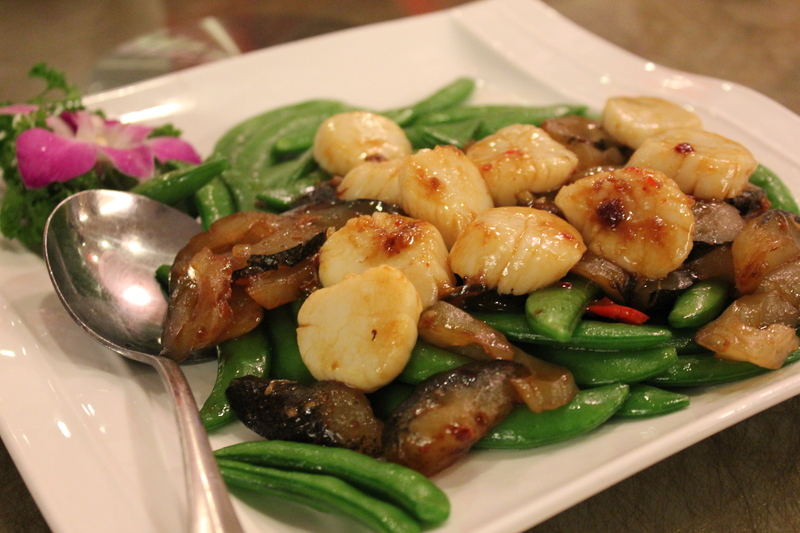 We had the Stir Fried Scallop with “Gui Hua” Sea Cucumber in Special XO Sauce. The Stir Fried Scallop together with the slippery texture of the Sea Cucumber made it a tasty dish. 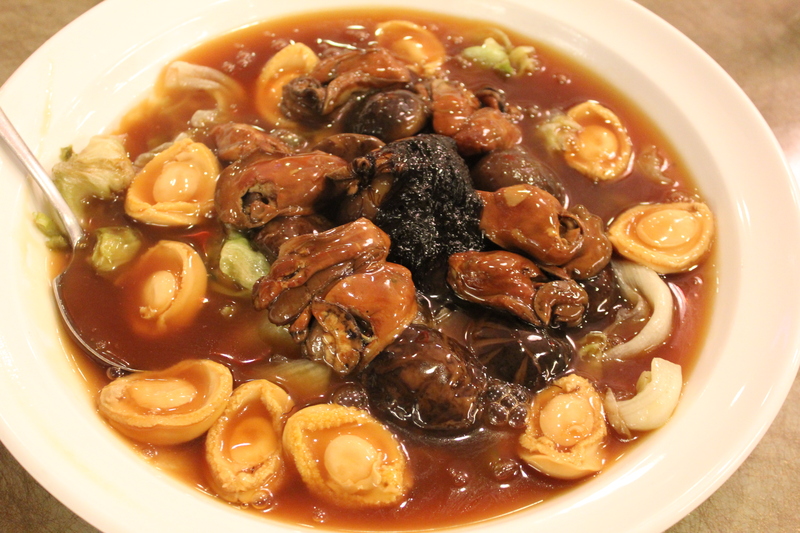 Not long after, the Braised Whole Abalone with Mushroom, Dried Oyster and “Fa Cai” (black moss) arrived. Surrounded by a generous amount of abalone was the mushroom, dried oyster and “Fa Cai” which complemented each other well and was full of flavour. 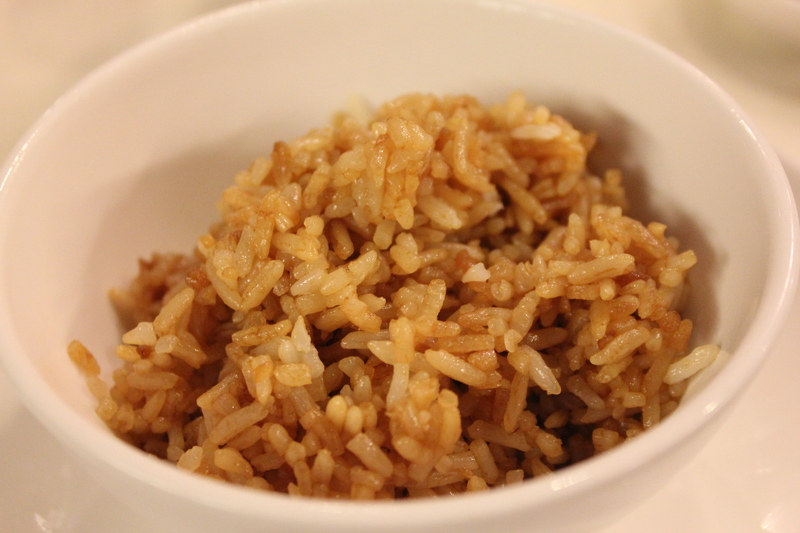 The Special Clay Pot Rice with Waxed Meat is another Chinese New Year dish. 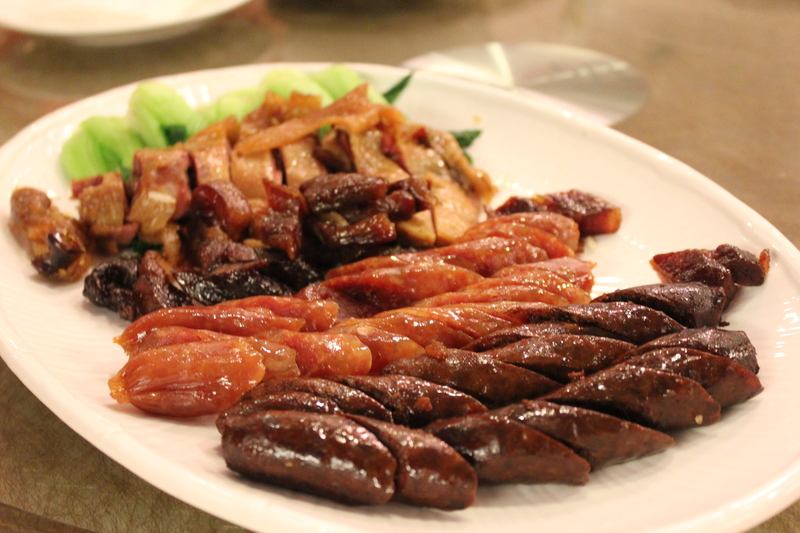 The waxed meats consists of chinese sausages, duck and pork. The waxed meats were delicious and not overly salty with its natural fats complementing the fluffy clay pot rice. It’s finally time for dessert! We had the chilled “Snow Mountain Seed” with Aloe Vera and Deep Fried “Nian Gao” and Lemon Puff to finish off the feast. 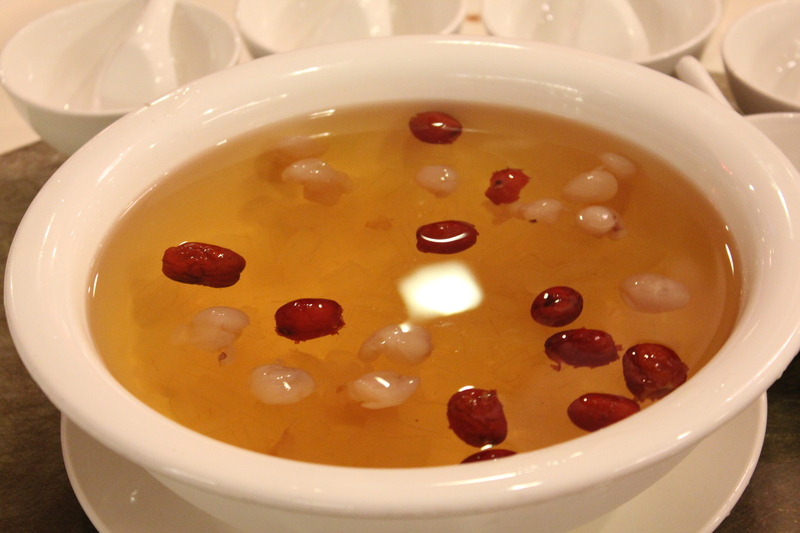 The chilled “Snow Mountain Seed” dessert was very refreshing with the Aloe Vera. It was a lovely dessert. The Nian Gao (new year cake) is traditionally eaten during Chinese New Year too. In Grand Kingdom, the “Nian Gao” is deep fried, so it is crispy on the outside and you get a soft texture in the inside which is the Nian Gao. 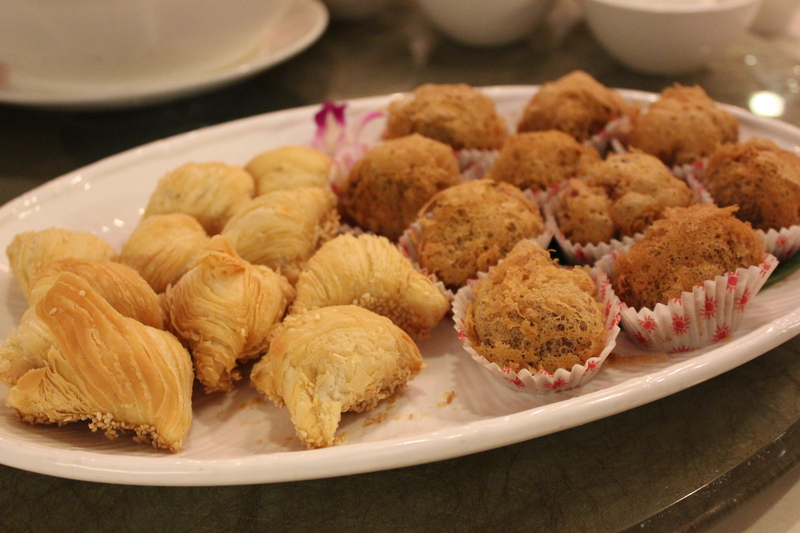 The Lemon Puff was fragrant and there were definitely flavours of lemon surrounded by the perfect and fluffy pastry. Together with food, laughter and happiness, it was a reunion dinner spent well with my family to usher in the year of the horse and to bid farewell to the year of the snake. I wish everyone a Happy Chinese New Year and may the year of the horse be another great year ahead!